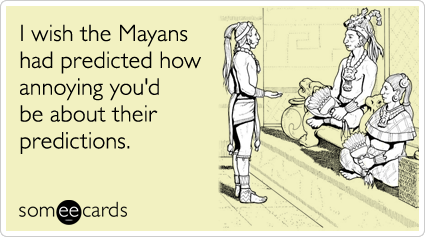 The most annoying thing about the “Mayan Prophecy” is that it isn’t Mayan. It’s a “prophecy” made by moderns about the Mayans, made by people who either misunderstand or willfully misrepresent their numerical and calendrical system. Some more reasonably minded folk have suggested the Dec 21st, 2012 date is nothing more than a Mayan equivalent to our own modern Y2K bug of a decade ago, but in reality it’s not even that. The Mayan long count calendar is perfectly capable as it stands of representing another 2,365 and a half years before it runs out of digits and has to reset the way our digital calendars rolled over from 99 to 00 without a column to indicate the century. To understand what the date does represent, it’s first necessary to gain a very basic understanding of how the long count calendar (used by much of Mesoamerica and not just the Maya) notates dates. First, the Mayan numbers were written in a base-20 not in the base-10 number system we know in most of the western world today). That is, whereas with our numbers each column of digits indicates a number from 0 to 9 before rolling over into the next column to its left, a Mayan number has symbols from 0 to 19. A further complexity is that in their calendrical system, the second column from the bottom (their dates are written vertically) only goes from 0 to 17, then the remaining three columns return to the 0 to 19 count (this allowed a full run of the second and first row to indicate 360 days, the equivalent to their year). In most modern transcriptions of the dates, we use a simple notation of 0.0.0.0.0 where the leftmost position correlates to the one traditionally on top and the right to the bottom. So we have a possible range of 0 days (0.0.0.0.0) to 2,879,999 days, or about 7,885 years (19.19.19.17.19). All December 21, 2012 corresponds to is the date 13.0.0.0.0, a period of 1,872,000 days, 5,125 years, since what the Maya held to be the date of “creation” of the current cycle in 3114 BCE, which is simply the last time they indicated the date to be 13.0.0.0.0 (which leads to one of the speculations that the topmost rung of the calendar may only go from 0 to 13 in the same way that the second rung only goes from 0 to 17 rather than the full 0 to 19). This whole “prophecy” mess got started with the discovery of what’s now known as the Bernal tablet during some roadwork back in the 1960s. It’s a large Mayan stele which originally held a great deal of text, including a passage identifying 13.0.0.0.0, the Dec 21st, 2012 date. However, the tablet is badly damaged with missing portions and more than a few passages on the surviving parts eroded or otherwise illegible including the part about just what it is that’s supposed to take place on that date. There remain only some vague remarks about the little known Mayan god “Bolon Yokte”, apparently associated in some way with “creation”, however just what his association is with the date is obliterated from the tablet. While you can find many of the 2012-world-ending sort today claiming it says Bolon Yokte will “descend from the sky” or whatever (which is anyone’s guess as to what that supposedly means), the archaeologist Bernal, who did the original translation, made it explicitly clear that the passage was speculation on his part and not at all visible on the tablet. It is just as reasonable, perhaps more so, to assume a reference to a god of creation is only in observation of the calendrical date being the same as that assigned to the original “creation” myth. Given that other Mayan inscriptions list dates far in the future of 2012, it’s very obvious that they themselves didn’t believe 2012 would be an apocalyptic end of the world. For instance, an inscription to commemorate the (future) anniversary of the 80th calendar round of K’inich Janaab’ Pakal’s coming to the throne projects to a date of October 21st, 4772 c.e. And despite the typical representation of long count dates as having only five parts, as detailed above, there are texts that add several more. The stele known as Quiringua F shows 9.16.10.0.0.1 and subtracts a “distance date” of 1.8.13.0.9.16.10.0.0 producing a final date over 90 million years in the past. On stele D from the same site, there’s a date of 9.16.15.0.0.7 that adds a distance date of 6.8.13.0.9.16.15.0.0 which would be more than 400 million years in the future from the time the stele was erected (circa February, 766 c.e.). Rather dwarfs 2012, doesn’t it? As for the association of the Mayan god to the date, if one considers comparative religion in general and not just a Mayan focus, the association of deities or supernatural entities generally, to calendrical cycles isn’t at all unusual or even overly significant. The Hindu system of yugas is particularly similar, citing the world to currently be in the Kali yuga (कलियुग), which they say began 3102 b.c.—only 12 years after the beginning of the current Mayan cycle. Curiously, they indicate the Kali yuga as the 4th cycle, while the Mayan text, the Popol Vuh, claims the current cycle is also the 4th. But don’t read too much into it: these kinds of coincidences happen all the time if you read broadly enough in comparative studies. In the end, the point is simply this: there is no prophecy by the Mayans that the world or anything else—other than a calendrical cycle!—ends in 2012. Since it’s claimed he spoke Aramaic, I expect he’d have used the Aramaic/Hebrew number system where their alphabetic characters also served as their numbers. (The languages, of course, also had names for the numbers, just as we have “1” and “one”, etc. ; I’m just referring to how numbers were written.) Since some of the apocryphal and pseudepigraphic infancy gospels tell tales of his having discoursed on the symbolism of the Greek & related alphabets, one might also argue that he could have written using the Greek number system, which likewise used its alphabet for numerical digits. If you consider the text of the “New Testament” as definitive, all numbers that appear in passages with references to Jesus in the four gospels are written out in Greek (e.g., εἷς/μία/ἕν [one], δύο or δύω [two], τρεῖς/τρία [three], τέσσαρες/τέσσαρα [four], ἕξ [six], ἑπτά [seven], ὀκτώ [eight], ἑπτάκις [seven times], ἐννέα [nine], δέκα [ten], εἴκοσι πέντε [twenty five], τριάκοντα [thirty], ἑκατόν [one hundred], ἑβδομηκοντάκις ἑπτά [seventy times seven], δισχίλιοι [two thousand], πεντακισχίλιοι [five thousand], etc.) Most numbers in the text tend to be written out, though there are a few exceptions: e.g., the infamous “666” of the Apocalypse is written with the three Greek letters chi (χ), xi (ξ) and the antiquated stigma (Ϛ); in the Greek numeral system, the letter χ has a value of 600, ξ 60 and Ϛ/Ϝ a value of 6, so that the three letters appearing together as a number have the combined value of 666. (See also the article, “Arithmology in the Bible” ). λέγει αὐτῷ ὁ Ἰησοῦς· οὐ λέγω σοι ἕως ἑπτάκις ἀλλὰ ἕως ἑβδομηκοντάκις ἑπτά. While both seven & seventy can have symbolic meanings, the passage may not be literal, but nevertheless it is an example of the idea of multiplication—though I don’t think it really makes it clear whether he or his listeners would have been able to give the answer. Having also asked why 0 wouldn’t have been used: neither the Hebrew, Aramaic nor Greek number systems had a character representing the number 0, as it wasn’t needed by non-positional number systems. There’s a whole section on the emergence of zero in Ifrah’s The Universal History of Numbers: From Prehistory to the Invention of the Computer , if I recall correctly. Some comments later published in A Passion for Mathematics , pp. 298–299. In the preceding post, “Polygorials”, I mentioned the class of numbers I’d discovered and written about in a small paper; here, I thought I’d offer a general description. Figuring more prominently in antiquity than in modern mathematics—though there are exceptions from Gauss to Euler to Cauchy, et al.—the subject of polygonal numbers is one that has long intrigued me. A subset of the more general figurate numbers, they consist of integer sequences defined by numbers that can be represented as geometric figures, regular polygons in this case. For example, the triangular numbers are those for which a number of pebbles can be arranged in the shape of a triangle; the squares, represented as squares; the pentagonal as a pentagon; and so on for the rest. where (m)n represents the Pochhammer symbol.